How to Play "Hava Nagila"
Enough math, let’s get to shredding. Triplets will add a new dynamic to your solos. And they may engage your audience in a way other note progression cannot. Why? The rule of three. Delay is one of the coolest and most heavily used effects in rock. In this column, learn a bit about the history of the effect, and a neat way to utilize it. There are no shortcuts to greatness. The old adage "practice makes perfect" lives on for a reason: the more you do something the better you will get at it. 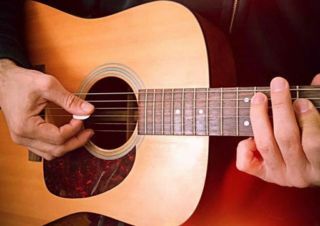 Even within complex solos, most guitarists play several notes on one string, and then move up or down to the next string.This creates melodically linear patterns. Tapping is one of the coolest, most impressive-sounding techniques in guitar playing. Not surprisingly, it’s also one of the most difficult and least understood. If you search for “shredding” on Google, two definitions will appear at the top of your screen: 1. To tear or cut into shreds. 2. To play a very fast intricate style of rock lead guitar.